Take a gander at this close-up of a red worm cocoon – looks like a miniature lemon. These little baby sacks are fascinating! but it’s no urban legend that red worms can survive a deep freeze. Worm cocoons can hang out unprotected in snow and ice for weeks and hatch into healthy little wrigglers! Still, we don’t suggest you experiment. 2) Being “over-due” is not a problem. No trips to spicy food restaurants or speed crawling marathons to loosen things up. Red worms don’t have to lug their cocoons around morning, noon and night, growing impatient and grumpy when their babies haven’t hatched. 3) Adult worms have baggage! Don’t gripe about that minuscule bag of red wrigglers you paid $20 for. It may work to your advantage to end up with babies and cocoons in your starter batch of worms. Even though it will take time for the worms to hatch and mature, those that “grow up with you” may adapt better to their surroundings than adults. The older worms that have fond memories of the manure they feasted on before you plunged them into that boring, tasteless shredded cardboard may try to escape. If your worms are trying to break out of the bin, blame it on worm baggage! 4) Talk about baby factories! “There must be something in the water”! 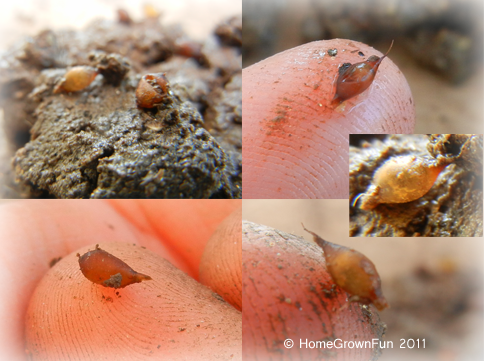 Worms can produce 4 cocoons every week if conditions are right! Once a worm lets go of it’s cocoon, it moves on and finds another mate the following week if conditions are right. 5) They are like mood rings – but less fashionable. 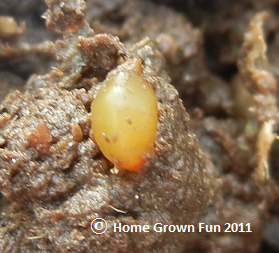 Cocoons start off a pale yellow color and turn dark red when the worms are about to hatch. Little lava lamps in your worm bins! A red worm has both male and female reproductive organs. Two worms get together. They exchange sperm and egg cells through a band-like area of the back end of the body called a clitellum. The clitellum secretes mucus to make the egg case or cocoon, protecting the sperm and eggs. The sperm in the cocoon fertilize the eggs and when ready, the end of the cocoon seals up as the cocoon slips off the worm into the bedding or soil. 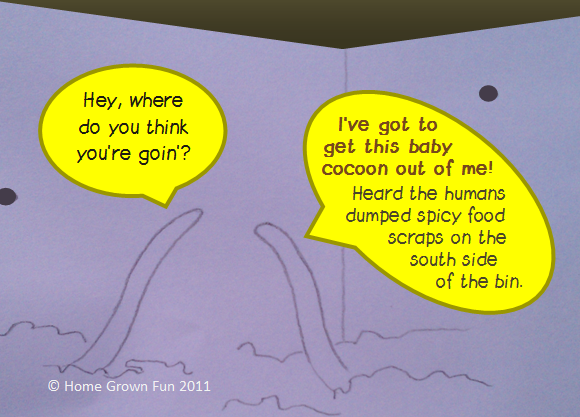 Each cocoon may have as many as 20 eggs in it but only some of those eggs actually survive and hatch into “wrigglers”. The eggs incubate for about 3 weeks before hatching. On average, 2-4 worms usually hatch out of each cocoon. 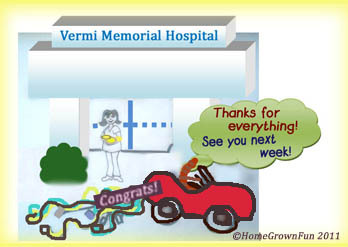 It takes 6 weeks for worms to grow up and become of age to make babies. What is size of worm eggs ? Hi Arun, it is about the size of a sesame seed but not as flat of course. It’s cool to see them when they are yellow and when they darken up. Sometimes they look like a tiny lemon and other times a deflated balloon. Sometimes before I use wet castings on my garden, I set a pile out to search for eggs. Kids love the challenge! Please connect here again anytime! to go on a country wide trip.